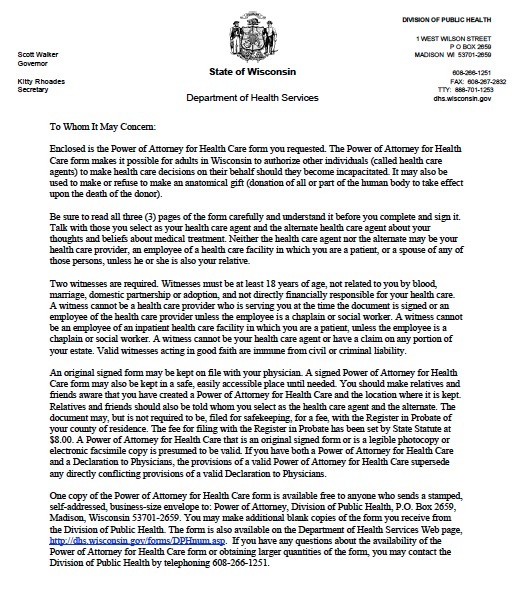 Wisconsin has enacted law that enables you to plan your medical treatment in advance by issuing written instructions with a medical power of attorney or a living will. In the unfortunate event that you cannot make decisions yourself, these advance directives could specify which medical treatments you would like to receive. The medical power of attorney lets you enable an agent to make almost any healthcare decisions for you, and instructs you to discuss your values thoroughly with the agent before granting the authority. The agent may not, however, admit you to certain inpatient facilities for mental health conditions. In Wisconsin, the living will is called a “Declaration to Physicians.” This document allows you to indicate your preferences regarding whether to continue life-sustaining treatments if you are terminally ill or permanently unconscious. These treatments include breathing assistance, blood transfusions, heart rate assistance, artificial nourishment, and kidney dialysis. The living will may not be used to discontinue pain medication if the physician believes doing so would increase pain or discomfort.